You would expect this old rustic shed to be in the outdoor garden of someone's yard, not along the banks of a peninsula in the town of L'Anse aux Meadows inNewfoundland Labrador. As the sun glistens over the water near sundown, this shed stands peacefully amongst the landscape with wisps of colored clouds hanging above. Rustic shed at the end of the peninsula in the town of L'Anse aux Meadows, Northern Peninsula, Great Northern Peninsula, Viking Trail, Trails to the Vikings, Newfoundland, Newfoundland Labrador, Canada. 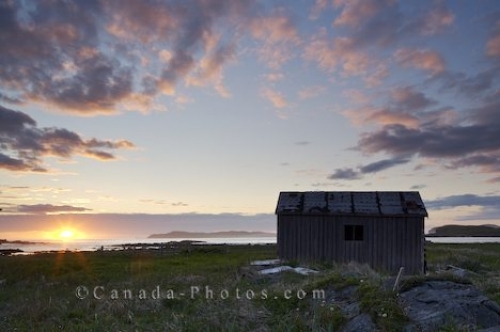 Picture of the sunset in L'Anse aux Meadows in Newfoundland Labrador where people enjoy the outside world near this shed.